Today, I’m teaming up with nine other bloggers to bring you guys TEN great recipes, projects, and printables for the Perfect BBQ! Be sure to scroll all the way to the end to check out all of the delicious summery goodness. But first, I’m excited to show off the latest addition to our outdoor dining space. 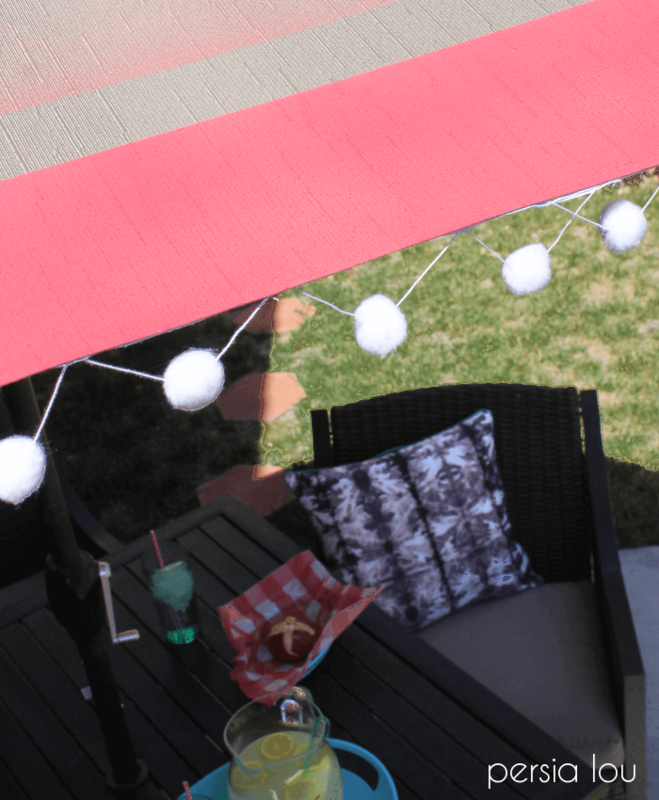 Recently, I was browsing the outdoor section at Target admiring a turquoise and white striped outdoor umbrella thinking about how bright and happy it looked compared to the perfectly serviceable, yet perfectly beige umbrella I had at home. Rather than drop some dough on a new umbrella, I decided to work with what I had and give our umbrella a bright and happy upgrade. 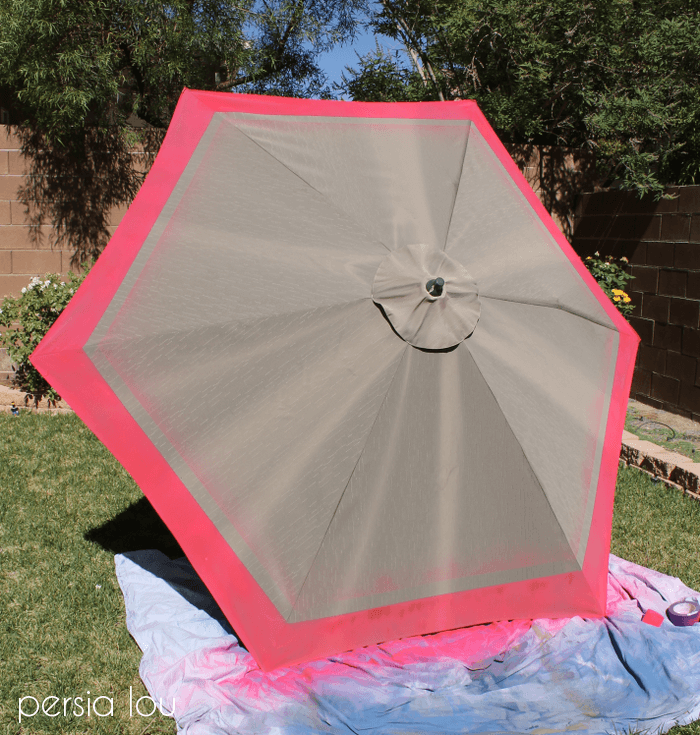 I started off by adding a hot pink stripe around the edge of my umbrella. 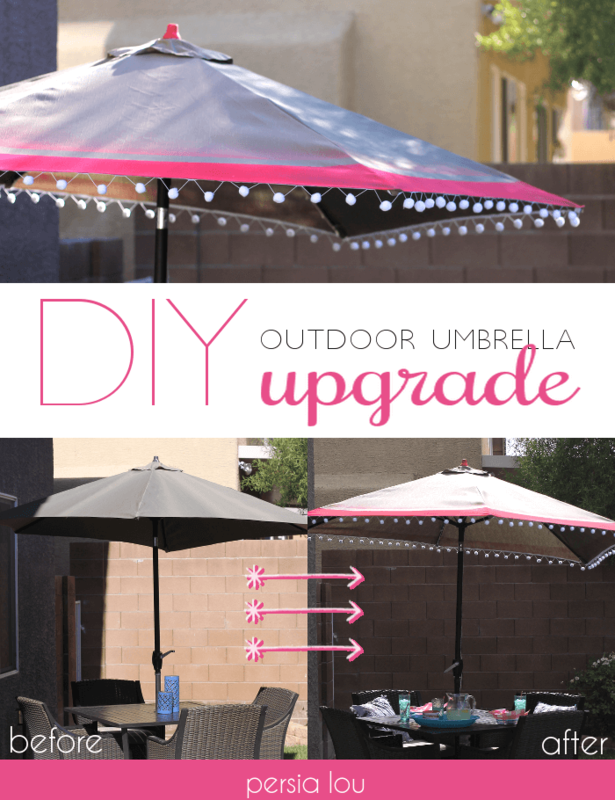 To do this, I opened the umbrella up and carefully laid it on top of my drop cloth. I taped a straight line across the bottom of the umbrella, five inches away from the edge. I tried to use painter’s tape at first, but it would not stick to the umbrella fabric at all, so I went with duct tape, which worked great. 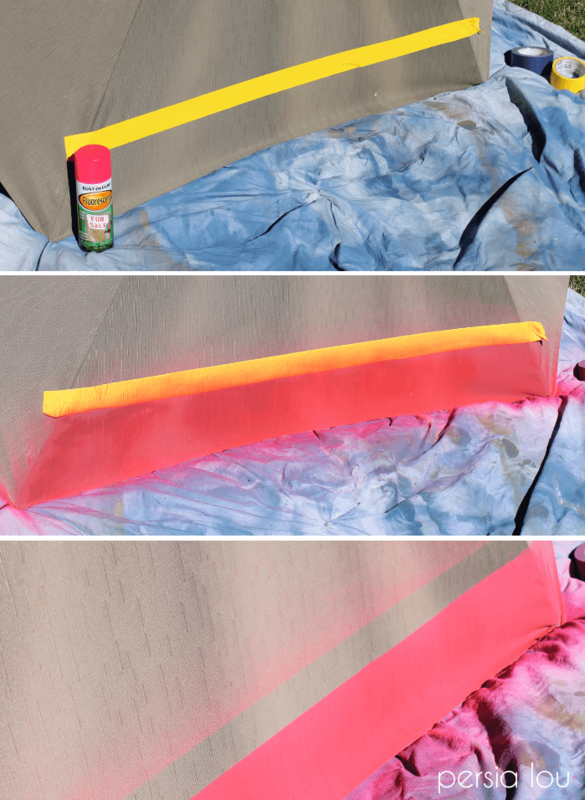 I painted with Rust-Oleum Fluorescent Pink spray paint . I only put one piece of tape down, and when I peeled it off the first side, I realized I had a little overspray ghost stripe above where the tape had been. For a split second I was bummed, and then I decided it actually looked kind of awesome. So the remaining sides of the umbrella all got intentional ghost stripes. Already happier, right? I also decided to paint the little black cap on the top of the umbrella pink too. It unscrewed easily, took a few coats of paint, and went back on. To up the happy quotient of my umbrella I thought it would be really fun to add a pom-pom trim around the bottom. (What’s happier than pom-poms?) So, when I was at the fabric store I went over to the trims, found some trim that would work perfectly, and… sighed heavily. Eight bucks a yard! Boo – I needed at least six yards, which would mean nearly fifty bucks for pom-pom trim. Wah wah. Sooooooo, I decided to make my own. Because I’m crazy. Seriously, that trim was the most labor-intensive part of this whole umbrella upgrade. But I do love the way it looks, and I will certainly be posting a tutorial soon in case anyone else is as crazy as I am. 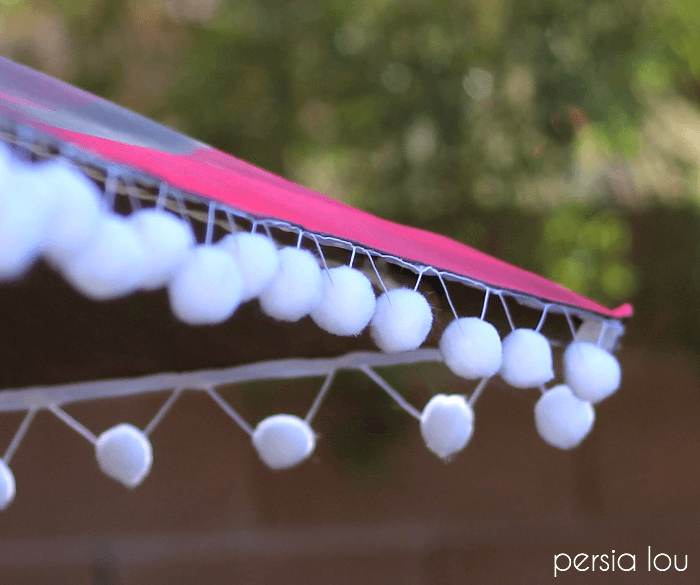 When my yards and yards of homemade pom-pom trim were all ready, I simple attached it to the underside of the umbrella using hot glue. And, all done! So what do you all think, bright and happy? Or just crazy? I really like the way it turned out. Right when I was getting ready to spray paint the umbrella I was sure it was going to be awful, but I was happily surprised with the finished project. 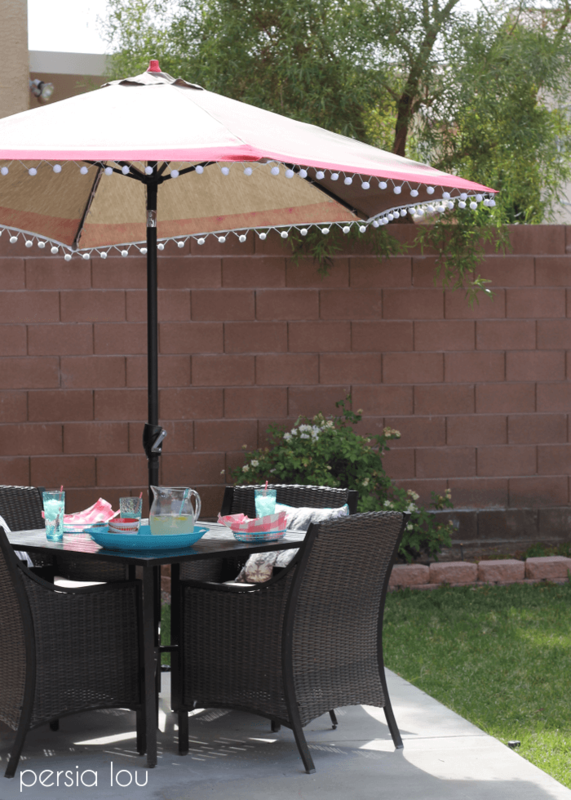 Now that my patio set is all decked out for summer, I think it’s time to throw a BBQ! Good thing I’ve got some talented friends to help me plan out the menu, invitations, and decor. (Seriously, doesn’t this look like a great party?) Enjoy! The umbrella looks great and I absolutely love the ghost stripe too! This is so adorable, Alexis! Pinning now. Wow girl, you totally lucked out on that happy spray paint accident!! Who could have planned it any better?! 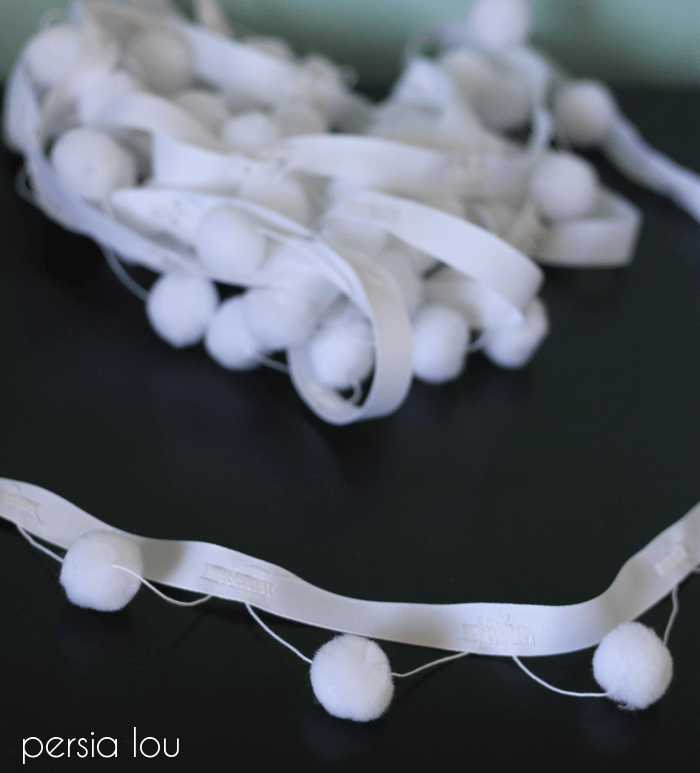 <br />That pom-pom trim looks amazing and totally worth it!<br /><br />And guess what?! Your updated umbrella looks waaay more awesome than a store bought one! Off to go pin! 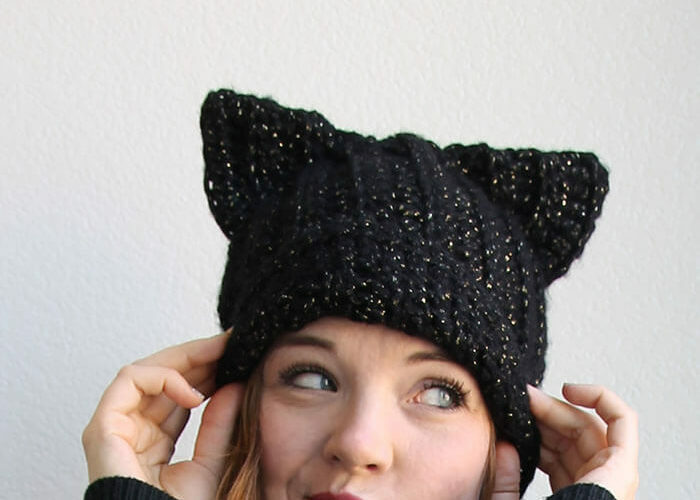 Oh man, that pom pom trim is worth every minute you spent making it! I love the flair it gives the umbrella (and that awesome pink accent). I&#39;m always so bummed that pom pom trim is so expensive but I&#39;ll have to see if I have the patience to make some the next time I need yards of it! I love every single thing a bout this. The over-spray has got to be the happiest accident ever. I&#39;m going to have to use that technique! love this umbrella redo!! so dang cute! This has got to be the happiest and cutest umbrella EVER! 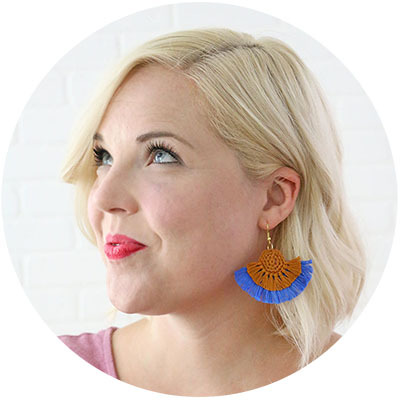 I love it and cannot wait for your pom pom trim tutorial! 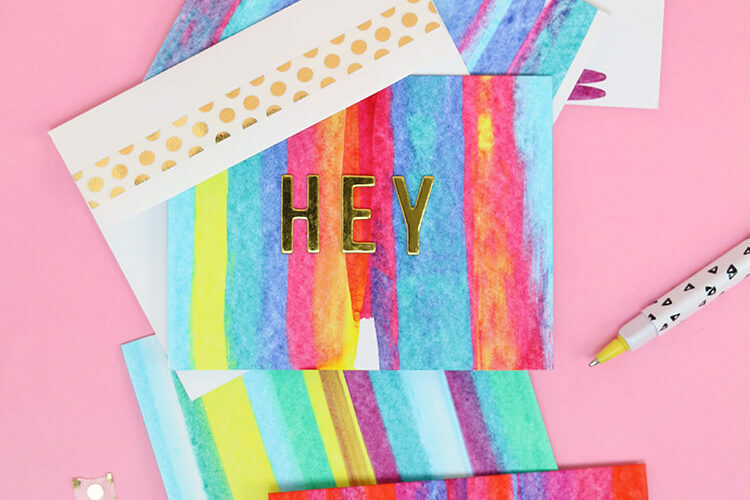 Thanks so much for teaming up with us for this blog hop! Love how it turned out (and it&#39;s exactly what I thought it was)! =) You definitely had the better idea to spray it! I really like the extra special touches you did with your umbrella….very nice! LOVE the way the extra spray looks! I probably couldn&#39;t recreate it if I tried! Thanks for including me in the blog hop. Oh my goodness – – I had to pause from stumbling to tell you how absolutely adorable I think this is! 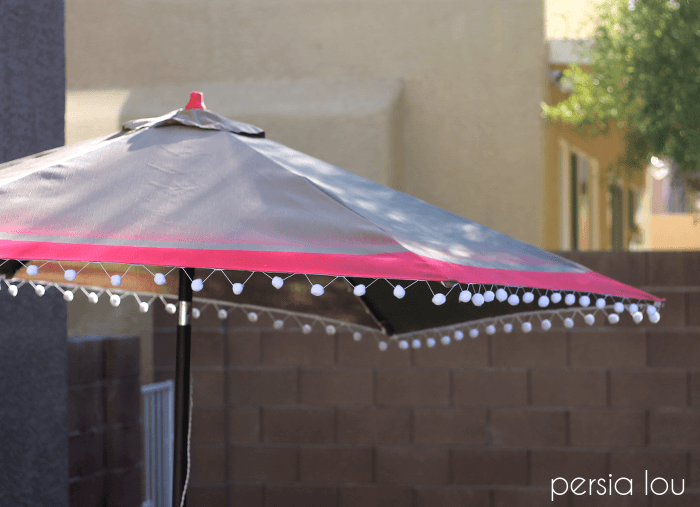 We have an old umbrella that we&#39;ve been debating replacing, and now you&#39;ve inspired me to consider just giving it a face-lift! So adorable!! I love the pink and the pom-poms! Very cute idea! I would love it if you joined and contribute your awesome posts at my link party at City of Creative Dreams, starts on Fridays 😀 Hope to see you there at City of Creative Dreams Link Party. I love the umbrella! Pinned. Thanks for being a part of our party. We are always thrilled to have you. Please stop by tonight at 7 pm and party with us. It&#39;s a thrill to have you!